CHICAGO, Illinois -- While investigating a break and enter in a suburb of Chicago, local law enforcement found the body of a young boy in amongst the broken furniture and shattered dinnerware of the looted home. 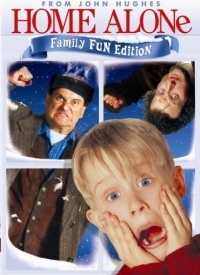 Kevin McCallister (foreground) shortly before being brutally murdered in his family home by two unidentified men (background). "The little tyke appears to have put up a good fight." said Detective Mike Plinski in a press conference held outside the spacious home, "It's too bad he was only ten years old. An older boy, say twelve or thirteen, could have probably resisted the perps by, oh I don't know, watching old A-Team episodes and cobbling together a cabbage cannon or an armored something-or-other." 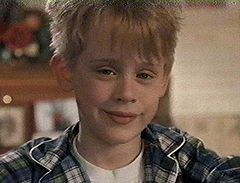 The city of Chicago has recently been caught in a wave of crime, which the media have christened the Home Alone Heists, where two incompetent but oddly endearing crooks break into a home looking for televisions, jewelry, refrigerated foodstuffs and other high-value items to exchange on the street for drugs. These break-ins are generally thwarted by the high-concept antics of a loveable but irritating occupant of the home. "Just why he was home alone perplexes me. We've got some hard questions for the parents, that's for sure. It's like they went on vacation and forgot their only child...how they could forget that precocious brat I don't know." continued Plinski. "We're putting out an APB for two suspects; the first looks exactly like the nerdy guy from 'City Slickers' and the second bears a striking resemblance to Joe Pesci...but not the real Joe Pesci, rather a Joe Pesci who only did this because he desperately needed the money." "Forensics indicate that the boy barricaded himself in the home and planned to watch the filthy channel to which his parents subscribe but that he is not ordinarily allowed to access. While viewing this channel he planned to be confused and frightened by the carnal acts that take place with clockwork frequency on channels of that nature. Trust me, after we rolled the body off of the couch we sat and watched it for eight solid hours. It's pretty messed up. Heck, the missus won't let me do most of that stuff, and she only does that one thing on my birthday." The victim in his earlier, pre-murdered, state. "Anyway," said Officer Larry Winschel, hastily pushing aside Plinski, "The kid set up a bunch of humorous but potentially harmful traps, like icing down the concrete steps, using household irons and paint cans as improvised projectiles, and electrically heating a doorknob to burn the hand of whoever attempts to use said doorknob to gain access to the room on the other side of the door to which said doorknob is attached. Unfortunately these traps, while humorous, only delayed the burglars and drove them into a blind rage. They really messed him up when they finally got to him." At this point he unzipped the body bag containing the badly mangled corpse. Flash photography was not permitted, but 8X10 glossies were available for sale from the trunk of a squad car for a nominal fee. On a side note, this reporter was shocked to discover that the Chicago Police Department doesn't take post-dated, out of state, third-party checks. The corpse was pretty shocking too. Police are soliciting for members of the public-at-large that have information about the two suspects to contact their anonymous 'Crime-Stoppers' line. They also recommend that you stay out of their way should you spot one or more of the two suspects, as the criminals are considered to be unarmed and vaguely comical. This article was nominated to become a featured article; however, due to several votes being devoured by a Froglok, it didn't make the cut (10.5/12). Don't let this happen again! For just pennies a day, you can prevent another travesty of this nature, or vote for other articles at Uncyclopedia:VFH.